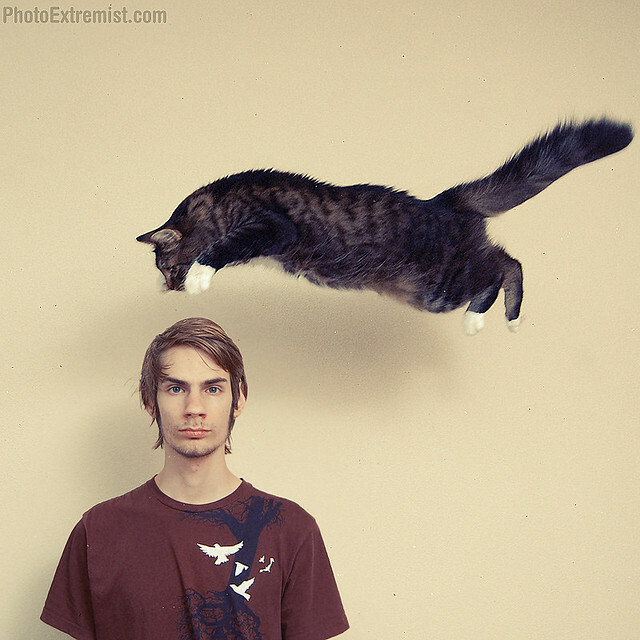 In order to take a photograph of a cat flying above your head, levitating in mid air or floating, you will want to use a short shutter speed of 1/200 or faster, such as 1/1000. In this example, I was using 1/400. Settings: Nikon D50, 18-55mm lens, 1/400 sec., f5, ISO 200, Custom WB, Manual Mode, Manual Focus. As you can see in the video, I was using two flashes (both at full power). The big studio flash was closer to me -- slightly to the left -- which casts the shadow. I also had another external flash in the far corner of the room, just to fill in some extra light. Both lights were pointing up at the ceiling. This makes it so the light is very soft and diffused. My camera was locked in on a tripod, which is very important. The camera needs to be in the same location in 3D space because we are doing a composite of two photographs. This is trick photography, folks. I also used a wireless remote for two reasons. 1) To keep the camera in the same location on the tripod (even a slight bump will mess things up) and 2) to take the picture when I need to, at just the right time. Chances are that your first shot won't be perfect, so you will have to keep taking photos of the cat being launched into the air multiple times. Careful not to do it too many times all at once or s/he might get upset. Because I was working with flashes, the light in my room and the lights on the tree lamp didn't effect the photograph in anyway because they weren't bright enough to go against the insanely bright flashes. Remember to use manual mode (we are working in a studio environment, so manual mode is the most practical) and manual focus because if you don't, when you go to push the button to take the picture, your camera will struggle to get the auto-focus correct, and by the time you know it, the cat will already be on the bed while your camera is still trying to find an auto-focus point. 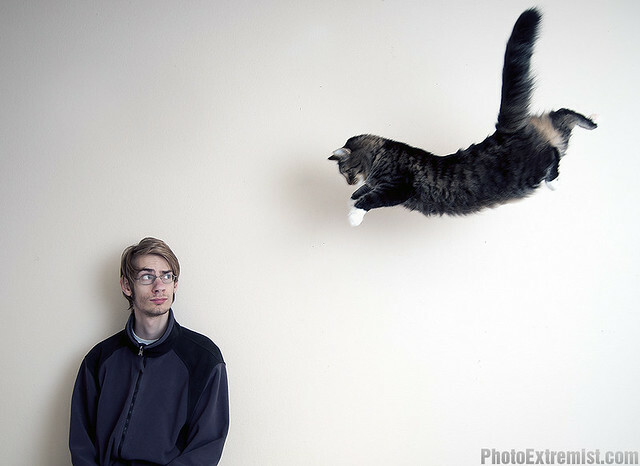 You might have just gotten worried after you saw that last frame in that comic where the cat was flying backwards. Don't worry, all I did was rotate the cat in Photoshop! Pretty cool huh? Make sure to retweet this post, +like it, share it, and leave a comment if you have any questions. this is awesome !Thanks for sharing ! U rock ! Greet all your loved ones this special day with our best Happy New Year New year Funny pictures. Enjoy Happy new year. 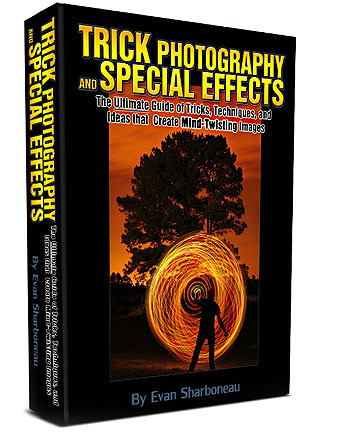 Levitation Photography: 65 Stunning Examples & Tutorials | VenkateshTech– Best Web Consulting company in India with Creative and Professional Website Design, Content Management Systems, Wordpress Experts, Ecommerce SEO, and more.. Flying Cat + Tutorial « me0w!